Mexican Hat and surroundings, Goosenecks State Park. Highway 163 is the only road through Mexican Hat, passing all the limited facilities which comprise a gas station, gift shop, campground, several restaurants, and four motels, one of which (San Juan Inn) sits right beside the river, next to the road bridge across into the Navajo Indian Reservation. 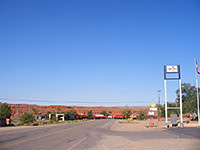 The nearest chain hotels are in Kayenta (43 miles west) or Blanding (50 miles east). 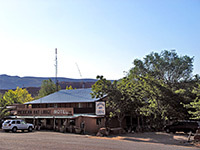 Besides providing a base to explore the surrounding scenery, the town is also popular as the start (or end) point for rafting trips along the San Juan River - these usually run between Bluff and Mexican Hat, or from Mexican Hat downstream to the upper end of Lake Powell, exiting via the Piute Farms Road near Monument Valley. The Hat Rock after which the town was named can be reached by a short track leading from US 163 to the San Juan River, and with moderate effort it is possible to climb to the top, to a summit that affords good views of the surrounding red and grey rocks, many of which have been twisted into strange convoluted forms. Near the end of the track there is an excellent (free) place for camping, with views of the Hat and the river. The greenery along the water's edge contrasts vividly with the swirling reds and grays of the canyon walls. 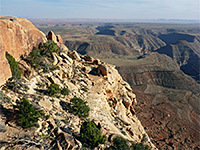 There are many other good free camping places nearby - at Goosenecks Overlook, along the road through Valley of the Gods, or at Muley Point - unlike south of the river, as here begins the vast Navajo Reservation, where camping is in general only permitted in official sites. 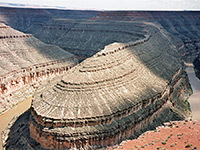 Mexican Hat is part of the Grand Circle and Indian Lands itineraries.